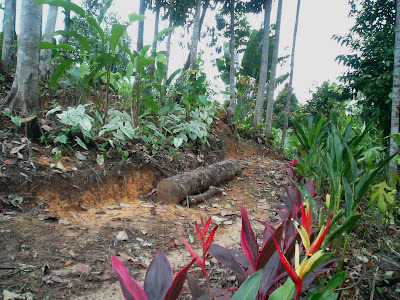 The planning now is to plant heliconia rostrata ,sometimes referred to as 'fire crakers' along both sides of the center footpath thats runs up the hill. In reality however you need to walk up the center footpath by a series of steps. I would prefer to call the planting along this center footpath as the Main Steps Planting from now on. 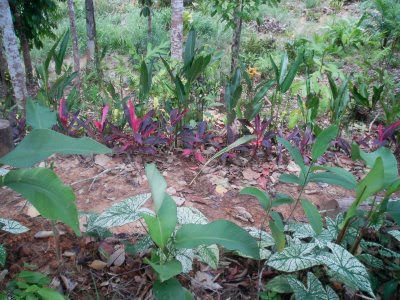 Planting of the heliconia rostrata have been done last month but due to insufficient quantities was not completed. Therefore whenever planting stocks are available progress would ensue. This morning I notice that the white caladium cover plants along the mid hill footpath are in excellent condition. The same goes to the cordyline terminalis ( Red Ti) planted at the opposite end of the caladium. Below is a view of the mid hill footpath taken from the top hill location. View of the mid hill footpath, looking east.